Overlooking Independence Mall, the National Constitution Center is a museum dedicated to its namesake document, and what it has done to the United States throughout history. It was opened on July 4, 2003. The Preamble is inscribed on the facade of the modern edifice, which stands fittingly with the neighboring Independence Visitor Center. Here you’ll find interactive exhibits on the history of the Constitution, and the many issues regarding its contents. Upon entering the museum, visitors are greeted by the Grand Hall, which is a semicircular atrium in which the flags of all 50 states are aligned in order of admittance to the Union. From the second floor, there are spectacular views of Independence Hall and the surrounding vicinity. It makes for a great view, and actually occupies a significant fraction of the museum’s space. Visitors should start at Freedom Rising, a 17-minute presentation that introduces the museum’s focus on what it means to be free, and what it means to be an American. The Constitution is introduced as a vision of a perfectly free society. Afterwards, visitors go to the American National Tree, a large, circular, dimly lit exhibit that chronicles the Constitution, the freedoms it provides, and the history of the United States, particularly about the 27 Amendments in the Constitution. The Constitution is written across the walls around the room. Many of these exhibits are interactive, including a variety of touchscreen activities. It also contains a few artistic pieces, including a spiral tower of law books and a large model of the U.S Capitol. The other major highlight is the Signer’s Hall, where visitors can walk around life-sized sculptures of the 39 signers of the Constitution. Each one has a name attached, and are pose as though they were conversing. Some of the more famous ones have biographical information around them. Benjamin Franklin is seated in the center. Admission is $14.50 for adults, $13 for students, youth (13-18) and seniors, and $8 for children. Military members are free. 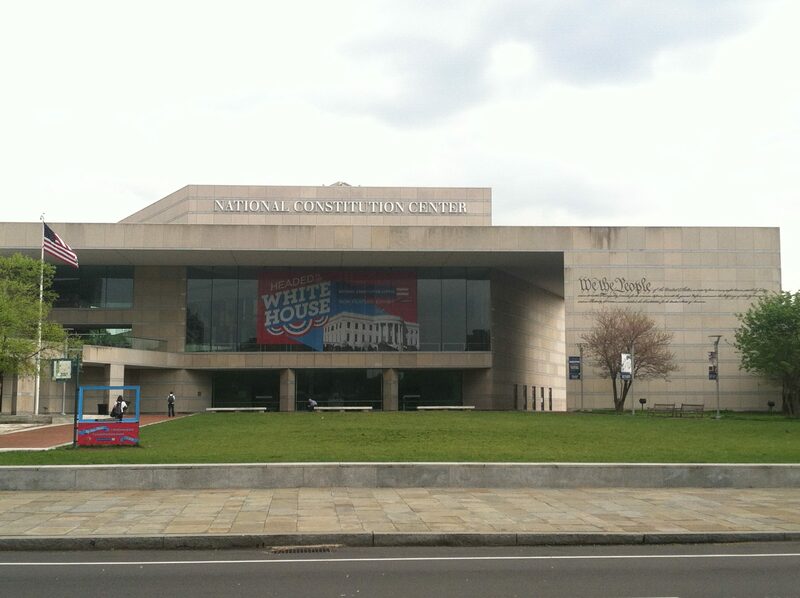 The Constitution Center is home to many political speeches and events, so bear that in mind. Perhaps it’s just me, but some of the touchscreens don’t seem to work. Also perhaps it’s just me, but I tend to be cynical of their approach to America as the land of opportunity. Not really a knock against it, just leads to me disbelieving some of their statements.